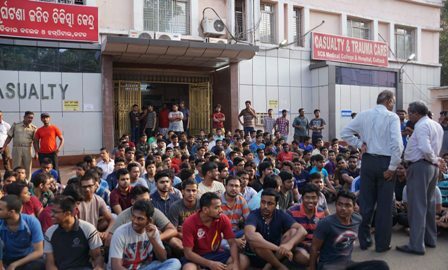 TNI Bureau: The House Surgeons and Junior Doctors at the SCB Medical College & Hospital in Cuttack, refused to end their agitation and said the strike would continue till their 3-point demands are met with. The doctors who are on a strike in protest against alleged manhandling of a doctor by a dead patient’s relatives, have sought transfer of Superintendent Prof. (Dr.) Shyama Kanungo, adequate security plus CCTV installation and hike in their stipend. Meanwhile, SCB management has decided to borrow doctors from outside so that healthcare services are not affected.